Congratulations to Abi of Guthrie Oklahoma who won 3rd place in regional competition for her topic: H.J. Whitley. I'm very excited for her and I wanted to thank her for spreading the word about the Whitley family's amazing saga. 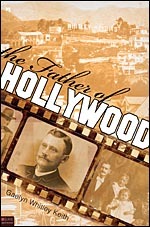 Who would you like to see play the leading role in "The Father Of Hollywood" movie? I have added a quick video to give you some suggestions. Read more: Who should play the leading role? People often ask me, "How did you find the time to write "The Father Of Hollywood" when you were working? What motivated you to keep going? For most of the six years that I worked on the true story of the founding of Hollywood I had a full-time job as a Realtor that often kept me busy in the evenings and on weekends. As a result, I plodded along ever so slowly on my book. There were many who thought I was foolishly hopeful. One never knows if publication awaits, or merely the desk drawer. Read more: Creativity is a life long adventure! Do you have a secret—something hidden deep down struggling to get out? I did. It's something that has been dwelling beneath the surface for more than one hundred years. It's something I promised my mother I would tell the world about. At last the truth needs to be revealed. Read more: Do You Have A Secret??? Over the last year, I have traveled across the country and met with readers like you, who showed up to hear me speak about The Father of Hollywood. I have received countless letters and e-mails in support of The Father Of Hollywood, and have always been moved by how passionately readers continue to embrace my first historic memoir.